The bridge in the picture behind us represents one of faith, dependence, & trust in our Lord as we cross into another country, culture, stage of ministry, and opportunities beyond what we can imagine or think. Craig and Denise are Life Coaches that help people grow and transform into their life calling and maximize their potential for the Kingdom of God. Through coaching, the Williams not only reach into the unbelievers’ world, but also are resources for the burgeoning number of missionaries from other South American countries who want to go to the harvest fields of the unreached. They also use marriage coaching to provide relational and spiritual refreshment to the Uruguayan pastors and their wives through marriage retreats. The Williams’ primary activity consists of church planting on a team with two other couples reaching unbelievers in their area of the Montevideo, Uruguay. 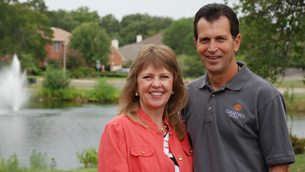 Over the last 20 years, Craig and Denise have ministered in Costa Rica, Mexico City and Austin, Texas serving broadly from church planting, theological education, leadership development, missionary field duties, marriage retreats for pastors and their wives and currently church planting in an ultra post modern culture.